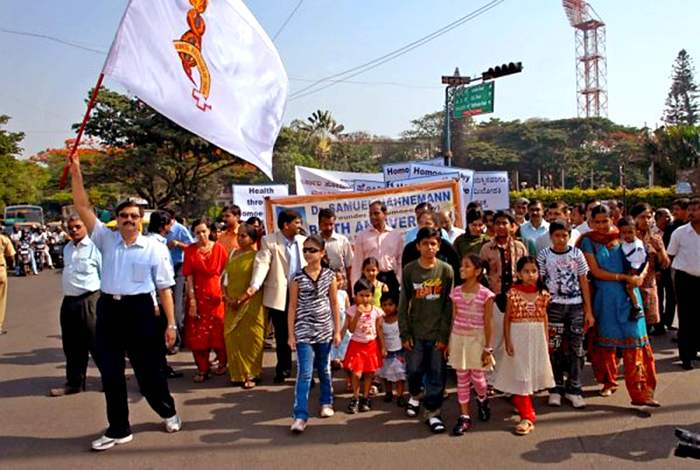 BENGALURU.APRIL.10.Karnataka State Branch of HMAI organized a rally to commemorate Birth Anniversary of Dr. Samuel Hahnemann "The Homoeopathy Day Rally", which statrted from Mahatma Gandhi statue on M.G.Road. The Rally was flagged off by Dr. E.V. Ramana Reddy, IAS, Principal Secretary, Health and family Welfare, Govt. of Karnataka, Chief Guest was Sri. D.N. Nayak, IAS, Health Commissioner, Health and family Welfare Services, Govt. of Karnataka, Guest of Honor was Miss Amoolya, Cine Actress. Sri. Srikantaiah, Director, Dept. of AYUSH, Dr.B.T. Rudresh, Member Syndicate, Rajiv Gandhi University of Health Sciences, Dr. Shantha Kumari, Deputy Director, (Homoeopathy) Dept. of AYUSH, Dr. Veerabramhachary, President, Karnataka Board of Homoeopathic System of Medicine, Dr. M.R. Srivatsan, Member, Central Council of Homoeopathy, also participated with physicians, students and well wishers .